Another Industry-Funded Lobbyist Tapped by Trump? From a video wherein Ms. White discusses the “benefits” of carbon pollution. 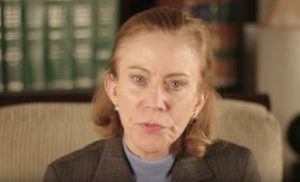 For the top White House environmental position, Director of the Council on Environmental Quality, President Trump is considering Kathleen Hartnett White. She’s a registered lobbyist, and is currently with the Texas Public Policy Foundation, an advocacy group funded in large part by the energy industry. She seems to have spent most of her time there spreading “alternative facts” on air pollution and climate change. As my colleague Jeremy Symons wrote when White was considered to lead EPA, she has long been a critic of the EPA’s efforts to reduce toxic air pollution such as soot and mercury. In a 2016 op-ed for The Hill she attacked the agency for pursuing standards to reduce air pollution from fossil fuels. Unfortunately, this appointment would be part of a pattern. Nearly one-fourth of all Trump administration officials who deal with environmental regulations had connections to energy companies, according to a new study. This is on top of an energy and environment cabinet that represents a single point of view: big energy companies. Few of the officials seems to have relevant experience or knowledge beyond that. For instance, at the Environmental Protection Agency, only 2 of 11 appointees have germane experience in the primary mission of the agency. Seven had connections to the fossil fuel industry, which EPA regulates. She is apparently not a fan of the scientists at NASA, the National Academies of Science, and all major American scientific organizations. If we are to protect clean air and water, and keep pace in a world moving toward cleaner energy, we need leaders who are looking forward. Right now, with the environmental positions in the cabinet only representing one voice, we risk damaging America’s future. And the addition of Kathleen Harnett White would add ignorance to injury. This post originally appeared on our EDF Voices blog. 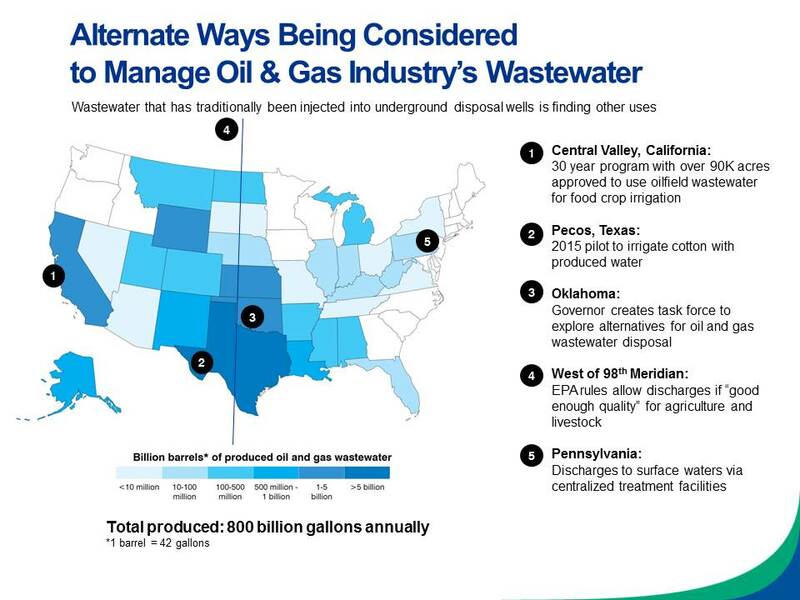 The engineers and scientists who study the oil and gas industry’s wastewater know the term “beneficial reuse” well. It’s the seldom-used technique of taking wastewater produced from an oil or gas well, treating it, and then using it for other purposes — like watering crops (including organic crops) or feeding livestock. It’s a rare practice that drought-stricken areas like California have used for a number of years, although little is known about associated health or safety risks since, usually, about 98% of wastewater is injected into disposal wells deep underground. However, as demands for water increase, and concerns about disposal wells (which have been linked to earthquakes) rise, beneficial reuse is being considered as a viable option. But just because we can use wastewater for other purposes – does that mean we should? Scientists researching these issues still have a lot of questions. Our recent article in World Water: Water Reuse & Desalination—a publication of the Water Environment Federation — highlights some of the biggest knowledge gaps we still need to address in order to confidently answer that question. A couple of the largest questions needing answers: what is in this wastewater and could it be toxic? 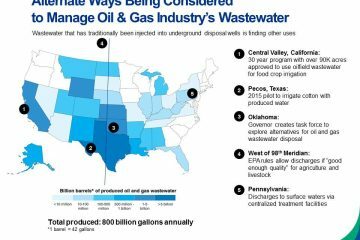 The oil and gas industry’s wastewater contains a vast assortment of chemicals – including constituents that are pumped into a well, chemicals already present in the fossil fuel formation, and constituents that are formed when these chemicals mix. There is not a true count of how many chemicals may be in the water (another huge question to be answered), but a review of the national chemical disclosure database FracFocus and other literature identifies more than 1,600 different chemicals potentially present. Some advocates for beneficial reuse argue we know enough to safely treat and use the wastewater for crop irrigation. But the unfortunate reality is that our current scientific methods can only detect about a quarter of those 1,600 chemicals. And we know even less about how toxic they may be – critical toxicity information is available for less than 20% of these chemicals. Even of the small group of chemicals in which detection methods do exist – they don’t always work. Oil and gas wastewater is extremely salty, in some cases 10 times saltier than the ocean, and testing technologies don’t always perform in such high salt content. Meaning we don’t even know how to adequately detect potentially toxic chemicals. This kick starts a chain reaction of other unknowns. Without accurate testing, we can’t know what chemicals we could be exposed to or how toxic those chemicals might be, which means we can’t be sure that current treatment processes are effective or regulatory programs adequately protective. Even in California where the practice of using treated oil and gas wastewater for irrigating crops has been done for years, this practice is being looked at more closely. Last year The Central Regional Water Quality Control Board convened a panel of experts to examine the potential adverse impacts of beneficial reuse. The panel’s work is still ongoing, but a report authored by some of the panelists raised a number of viable concerns. EDF is leading a number of efforts to expand the needed science. Last year we held a series of workshops with experts from across the country to assess how we can use existing technologies and tools to help narrow some of these knowledge gaps, and as a result have spurred a number of new research projects, including some we are leading to improve current wastewater testing methods. We’re making progress, but we still have a way to go. Before policy makers start green-lighting an increase in beneficial reuse, we need to honestly acknowledge what is known, what is not, what is of concern, and give science time to provide some answers. What do you think that healthy communities, opportunities for businesses to expand, and diesel engines have in common? The answer: in Texas, they’re tied together through a successful voluntary program called the Texas Emissions Reductions Plan (TERP). TERP has been heralded by many diverse cheerleaders. We have talked about TERP’s success (and areas for improvement) in the past on Texas Clean Air Matters, but we aren’t alone in our support for the program. In fact, the program’s achievements were recently mentioned by Secretary of Energy and former Texas Governor Rick Perry, who talked about TERP during his confirmation hearing opening statement. The program is also supported by both the Texas Association of Business as a 2017 Legislative Priority, and the Texas Clean Air Working Group (comprised of many local government officials, including air quality planners and others) which advocates for full funding of the program. Unfortunately, despite strong support for the program from diverse stakeholders, the Texas Legislature is holding hostage $1.2 billion in TERP funding that has been collected by Texas taxpayers and businesses. TERP is funded through a variety of mechanisms, as detailed below in the left-hand column on the table (“TERP Inflows”). 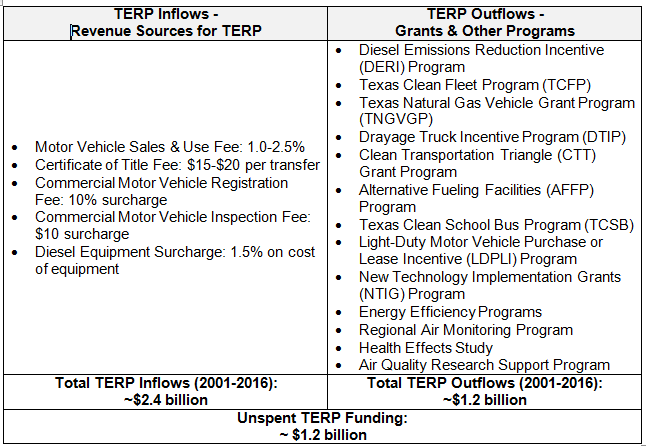 TERP programs receive appropriations from the Texas Legislature each biennium, as is shown below in the right-hand column (“TERP Outflows”). To date, more than $2.4 billion has been collected since the program’s inception in 2001, but only $1.2 billion has been spent on clean air projects. The unspent $1.2 billion is not being used for its intended purpose, but instead has remained on account to balance the state budget. Over the years, this amount grew because the Texas Legislature failed to fully appropriate all revenues that were collected for TERP and instead held funds back, growing the state’s coffers instead. Moreover, the 2017 Texas Legislature appears to be considering holding back even more funds from TERP (see Senate Finance Committee Decision Document) as recently as last week. This means that the balance in the TERP account will continue to exceed the amount that has been spent on clean air projects. 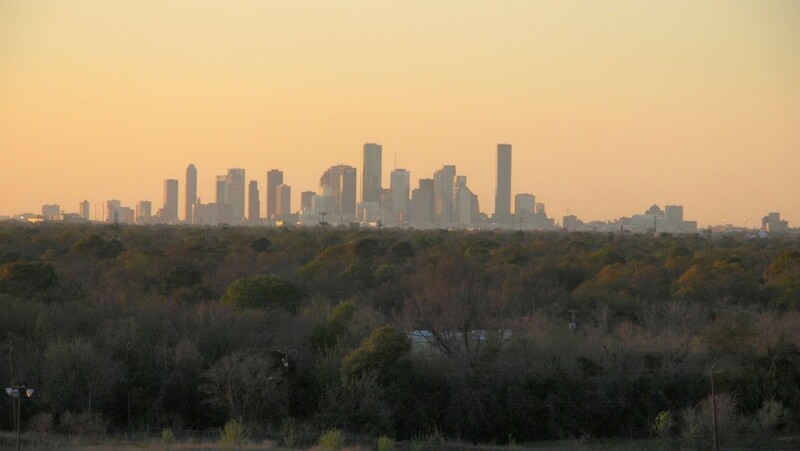 This is not only dishonest to Texas taxpayers and businesses who are paying for TERP, but the Texas Legislature is literally choking Texans by halting potential emissions reduction projects that could be helping improve air quality. It’s time that Texas lawmakers do the right thing by Texans – spend this money that has been collected from Texans for clean air rather than keeping it in state coffers. It’s time to restore this clean air funding so that all Texans can breathe easier. Just hours after President Trump signed an executive order to weaken a wide range of America’s important climate and heath protections, the Administration filed a motion to delay the D.C Circuit court’s review of the Clean Power Plan case. That’s only the first of what we expect will be many attacks on the Clean Power Plan – our only nationwide limit on climate pollution from power plants. However, the Clean Power Plan is popular with Americans across the country, and an extraordinarily broad and diverse group of leaders and experts from across America have announced their support for the Clean Power Plan since the executive order. You’ll likely be hearing a lot about this story in the near future. While you follow the news, here are 10 things you should know about the Clean Power Plan. 2. The Clean Power Plan’s pollution reduction targets are eminently achievable. Carbon pollution from the power sector has decreased by more than 20 percent since 2005, meaning that we’re already more than two-thirds of the way toward meeting the Clean Power Plan standards for 2030. In fact, most states that are litigating against the Clean Power Plan are on track to meet these pollution limits. The Clean Power Plan is essential to ensure that this momentum is sustained and that power sector investments in clean energy are deployed in a way that maximizes their pollution reduction benefits. 3. The Clean Power Plan can reduce electricity bills for families. The Clean Power Plan gives states and power companies tremendous flexibility in deciding how to meet the pollution reduction targets – including through cost-effective energy efficiency measures that save families money. Independent analyses of the Clean Power Plan have found that average bills could decline by as much as 11 percent as a result of these measures. That’s why leading consumer and ratepayer advocates, including Consumers Union, support the Clean Power Plan. 4. Our vibrant clean energy sector employs millions of Americans and it is thriving. According to a recent assessment by Advanced Energy Economy, the United States clean energy sector is now a rapidly-growing, $200 billion industry that employs 3.3 million Americans. 5. Clean energy is creating economic opportunities in communities across the nation. The American Wind Energy Association estimates that 70 percent of wind farms are located in low-income counties, and that wind developers currently pay $222 million a year in lease payments to U.S. farmers, ranchers and other rural landowners. AWEA also estimates that wind energy has created more than 25,000 manufacturing jobs in 43 states. 6. The Administration’s promises that revoking climate and clean air protections will bring back coal jobs are false, as the coal industry itself recognizes. Independent analyses have found that employment in the coal industry has been falling steadily since 1975, due largely to changing methods of coal production and – in more recent years – by competition from inexpensive natural gas. These trends cannot be reversed by revoking the Clean Power Plan or other protections for clean air and clean water. Even coal company executives have acknowledged that the executive order can’t bring mining jobs back. 7. An extraordinarily broad and diverse coalition is supporting the Clean Power Plan in court. This coalition includes, among others: eighteen states and sixty municipalities; power companies that own and operate nearly ten percent of the nation’s generating capacity; leading businesses like Amazon, Apple, Google, Mars, and IKEA; former Republican heads of EPA; public health and environmental organizations; consumer and ratepayer advocates; faith organizations; and many others. 8. Large majorities of Americans in red and blue states alike support reducing climate pollution from existing power plants. According to a recent national poll, 69 percent of Americans support placing limits on climate pollution from existing power plants – including a majority of Americans in every Congressional district in the country. 9. The nation’s leading businesses support policies to reduce climate pollution. 10. The Clean Power Plan rests on a rock-solid legal foundation. Attacks on the Clean Power Plan and our other clean air protections present an unprecedented attack on our children’s health. It takes our nation backwards – to more pollution, more disease – even though Americans support forward progress towards clean air and clean energy.